Pioneers in the industry, we offer phase side cubicles and neutral side cubicles from India. Phase Side Cubicles offered are made as per the application it is put to. These cubicles feature effective functioning and require very low maintenance. 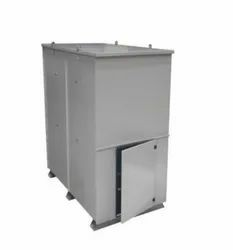 The design of phase side cubicles depends on the voltage level of the generator and the type of bus duct system between the generator and step-up transformer of the power plant. The phase side cubicles undergo functional testing of the complete assembled panel; continuity test and test on wiring; and the HV test, to ascertain their compliance with performance safety standards. The Metering cubicle shall be totally enclosed and shall be provided with two no. 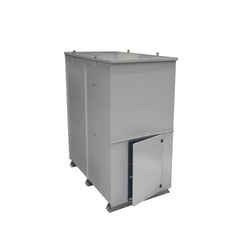 the hinged door made of MS sheet which shall rest on the collar along the four sides of cubicle so that the doors remain flushed with the body of the cubicle to the safety and performance standards. Neutral Side Cubicles and generator outlet are generally used for the connection of power terminals of the generators to other systems. Neutral side cubicles are also known as Main Terminal Boxes-MTBs. These cubicles have the required protective and measuring devices. A connection point is provided on the cubicle outlet for the encapsulated conductors or power cables. Depending on the size and construction of the genset, the number of cubicles varies. One design includes a single common cubicle for neutral and outlet point. The second design has two separate cubicles, one for the outlet devices and second for the generator neutral point. Neutral side cubicles are generally equipped with the voltage & current measuring, protection transformers, RC elements and surge arresters. The said RC elements play the role of over-voltage protector. These are custom designed and made by us, hence each solution is individual and personalized, ensuring more efficiency.